Today’s Flash Back Friday comes from Episode 131, originally published in March 2013. Astrologer Jeff Harman is a second-generation astrologer with over 36 years of experience consulting with people from around the world on personal and business needs. Jason Hartman and Jeff Harman engage in a discussion of the world’s possible economic future, and Jeff forecasts several future events based on global cycles, including a global electronic, cashless society by 2020. He says the next major alignment that is coming into play is 2020 and there is a big disruptive cycle coming up between now and 2015 that could bring a lot of turmoil in the financial markets that will lead to this cashless society. Jeff also explains how astrology has been used throughout history for advice on wars and other events, and the validity of ancient astrology versus the sun sign astrology that came about in the ‘60s. As Jeff explains, just like with physics, if an event or phenomenon is repeatable, it becomes something that can be relied upon or something that works, and it does have a very high degree of accuracy. Jeff spent many years in Beverly Hills and has clients in all areas of the entertainment industry. He is a member of the Council on Vedic Astrology, the American Federation of Astrologers, and the National Center for Geocosmic Research. He utilizes Classical, Vedic, Kabbalistic, and Astro-location Astrology. 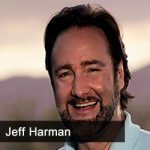 Jeff has appeared on many radio shows including Veritas Radio with Mel Fabregas, Coast to Coast AM with George Noory, as well as many other shows. Besides being a life-long astrologer, Jeff Harman owns Conjunction Entertainment, a new motion picture company. Jeff has a diverse career in the entertainment industry and a technical background in the areas of audio forensics, audio engineering, electronic design consulting and acoustical consulting. Jeff has taught physics of sound and acoustics, electronics, and advanced acoustical design, testing and audio engineering. He has held classes at such places as the renowned Riverbank Acoustics Laboratory in Geneva, Illinois, which was involved in secret work for the military during WWI and WWII and Carthage College in Kenosha, WI. Jeff has worked in production, filming and recording with such diverse people as George Carlin, Mother Teresa of Calcutta, Greg Morris from Mission Impossible and one of Hollywood’s directors of classic westerns, Budd Boetticher, as well as many others. Jeff was once consulted as an analyst of the JFK assassination footage. He has also conducted forensics work in voice print analysis and other audio technical capabilities with many federal, state and local agencies.